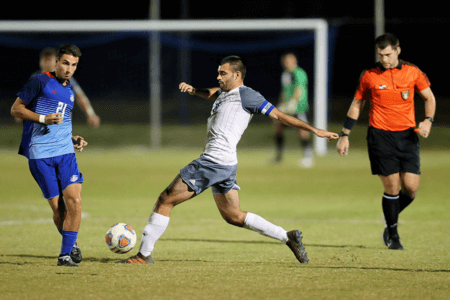 In his senior season on the St. Mary’s University Men’s Soccer team, Pato Botello Faz took the Heartland Conference by storm and signed to play with a United Soccer League club in Michigan, the Lansing Ignite. His six game-winning goals pushed the Rattlers as high as No. 12 in the national rankings and helped secure the team’s first home-field playoff at Sigma Beta Chi Field in Fall 2018. Botello claimed two conference Offensive Player of the Week honors and earned both Offensive Player of the Year as well as Player of the Year. He was voted to the 2018 Division II Commissioners Association Men’s Soccer All-America Second Team, becoming only the fourth Rattler to do so and the first in 20 years. We caught up with the easygoing Exercise and Sports Science senior to reflect on his time at St. Mary’s. Q: What made you choose St. Mary’s? A: The community, the coaches, the facilities and teammates — it all made me want to come here. Q: What got you into soccer? A: Seeing my brother play when I was little, probably around 4 years old, made me want to jump in there and play too. I actually started playing with his team after that. Q: Do you have any pre-match superstitions or traditions? A: I have to wear the same socks every game. I always put my right sock on before my left sock and my right cleat before my left one. Pray — I have to pray. Q: How do you balance athletics with school life? A: It’s easier when I’m in the season, because it’s kind of like a routine: school, practice, homework, sleep. It actually gets harder when the season ends. That routine kind of fades. Q: You had many international teammates this year. What was it like playing with them? A: Playing with so many international players can be challenging at first because everyone has a different style of play. But once we all got on the same page, it was very good. It is very cool to learn from different cultures as well. Q: For you, what is the biggest benefit from coming to St. Mary’s? A: It’s a great education. It gave me the opportunity to sign with a professional soccer team. That’s been my dream since I was a little kid.